Weleda uses 100% natural and organic plant and fruit extracts to formulate products for the face and body as well as specially formulated baby care products, first aid care and medicines to treat hay fever and other allergies. For those of you who are not familiar with Weleda, the company has been formulating natural-based products using ingredients which have been grown in Biodynamic® gardens since 1921 in Switzerland. Weleda has become well-known worldwide for their premium luxury skincare products. Weleda has recently launched their newly formulated range of vegan and organic body lotions which are formulated using natural plant and fruit extracts which help activate the skin's vital processes in order to make it feel indulgently soft, smooth and radiant. These body lotions are concentrated with rich pure oils to help maintain and/or regain skins natural balance and nurture your skin. There are four types of lotions available in this new range and these include: Pomegranate Regenerating Body Lotion (for mature skin, A$33.90/200ml), Wild Rose Pampering Body Lotion (for normal to dry skin, A$36.90/200ml), Sea Buckthorn Replenishing Body Lotion (for dry skin, A$36.90/200ml) and Citrus Hydrating Body Lotion (for normal skin, A$33.90/200ml). 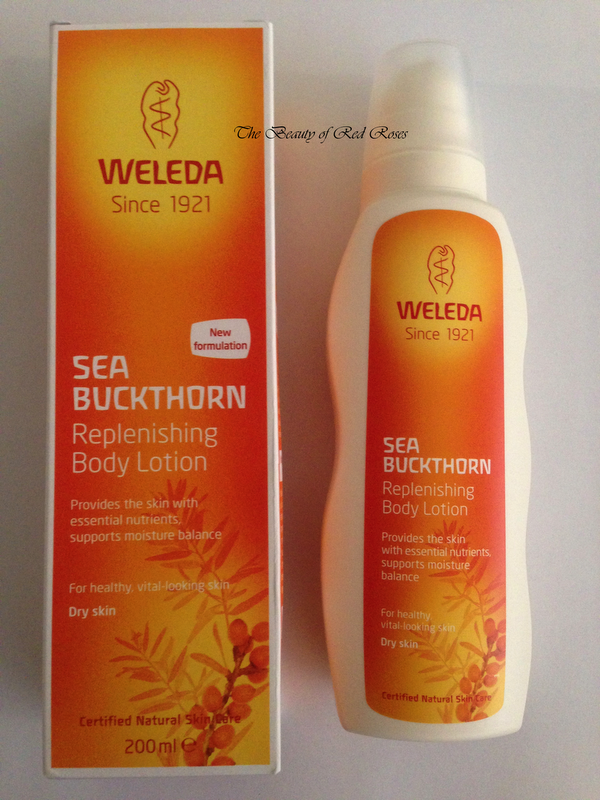 I was recently given the opportunity to trial the Sea Buckthorn Replenishing Body Lotion which is formulated for dry skin. Sea Buckthorn Replenishing Body Lotion is packaged in a convenient sturdy body which is shaped in a way to prevent slippage or dropping the bottle. The pump looks super cute with a rounded pump top which dispenses the body lotion without leaving any residues which dry up and look icky at the tip. I've been notified that each pump stroke contains approximately 0.8ml, which is enough to moisturise one arm. So, each 200ml bottle provides approximately 250 strokes or 50-60 usages. Sea Buckthorn is a vitamin rich ingredient which helps to stimulate the skins regenerative processes and the formula also contains skin-related essential fatty acids to provide hydrating and lasting care for dry skin. The formula is lightweight and gives a cooling sensation when applied to the skin. The body lotion absorbs quickly into the skin and doesn't leave any sticky or greasy residue. The formula also contains vitamin-rich oils from organic Sea Buckthorn, Mallow extract and Shea Butter to protect the skin from de-hydration. My skin feels very moisturised, smooth and soft to touch. The scent of this body lotion is absolutely divine! A burst of fresh and fruity aromatic scents escapes from this lotion and makes my skin smell beautiful! 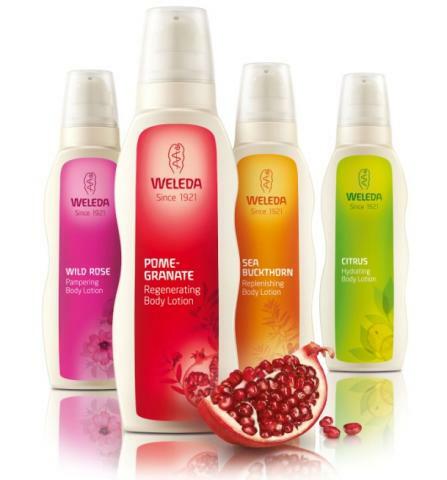 What do you think of Weleda's new range of organic body lotions? Which Weleda body lotion would you love to try? *Product was provided for consideration only. This review is 100% based on my own thoughts and opinions. 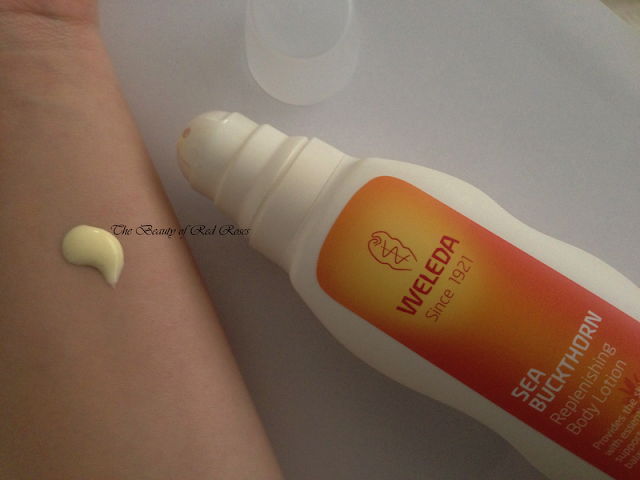 I am not affiliated with Weleda and did not receive remuneration to post this product review.